What do you use your Control4 System for? Master Control my home theatre, TV and stereo. Lighting control on our main floor. The areas of the home we live in most have C4 light switches set at desired lighting levels. For example, we don’t need 100% brightness in our living room, so we set it at 68% to save energy. All rooms are set at lower levels and we still have ample light. Saving energy = saving money. When I pause a movie to go to the kitchen, the TV room lights automatically turn on and when I come back and hit play, the lights turn back down. 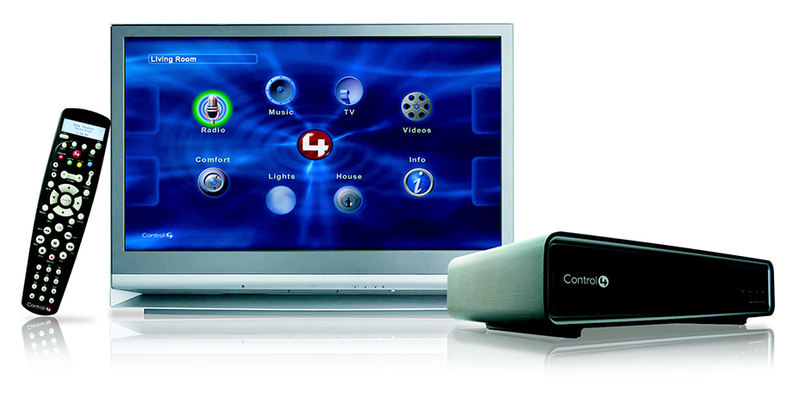 What is your favorite part about your Control4 System? My favorite part is the all-in-one remote control. I can use it on any of the 3 floors in the house, look up music by artist or albums and play as needed. I don’t need to be in the same room! 2nd favorite is the interface with my smartphone and tablet. The album art for all my music and movies is right there. I can control the music in all my rooms with the remote or app. It comes in handy when I entertain, as each zone has it’s own volume level setting. My entire A/V system and Control4 hub is hidden. All you see is my TV & Speakers! Was it easy to setup? All the programming of my remote controls and sequences were done by the store installer. He also updated my smart phone and tablet to use as an additional controller (visual remote control) that I can use anywhere in the house. He did everything on the same day and I was using it that evening. What did you need to set it up? HDMI cable and a component cable was all I needed to connect to my existing components. C4 also included extra IR buds that were attached to all my components. My wife loves it and my 4 year old can control it too! What components do you have in your setup? Would you like to add to your setup in the future? On my future wish list is to automate my garage door, add a front door camera/intercom system, and coded door locks. Then at night I can hit the “Good Night” button and my doors will lock and lights will turn off with one touch. Samsung goes on location for UHD Wildlife. Discover brilliant detail, at four times the resolution of Full HD. Samsung's UHD TV brings detail to life before your very eyes. BIG JAMBOX turns any phone, tablet or mobile device into a portable, hi-fi sound system. Now you can play music, movies and games and fill even the largest spaces with sound. Precision-tuned drivers and dual passive bass radiators work in concert to produce amazingly clear, full audio at any volume. Sonos is a wireless multi-room music system that gives you a world of music at your fingertips from the Internet and your computer. Play all the songs stored on your PC or Mac. Tune in to thousands of free Internet radio stations. And enjoy millions of songs and stations from the most popular online music services. The most impressive aspect of the Sonos system is the fact that you have your entire music collection--and the ability to distribute it throughout your house--at your fingertips. Don't want to pay for your music? The Sonos system comes preconfigured to play nearly 300 free Internet radio stations and can be configured to play additional stations broadcast in both the MP3 and WMA streaming formats. This is the first in a series of videos narrated by Paul Williams of Control 4 where he addresses the top 10 most frequently asked questions about home control. In this video, he explains what exactly is home control and what's all the buzz about it. Here's Paul Williams of Control 4 again with FAQ No. 2: will your current equipment work with Control 4? Here's Paul Williams with FAQ No. 3: How Expensive is Home Automation? Control 4 allows you to start small, such as automating one room only, and then to expand as your needs grow, or as you need more control. Paul Williams's tip No. 4: What can I control in my home? As explained in this video, a Control 4 system allows you to control not only your home theatre system but also the lighting and heating in your home, and much more. Get ready for Ultra HD Resolution!. The big buzzword at this year’s Consumer Electronic Show (CES) in Las Vegas was “Ultra HD” TVs. Ultra HD is the new designation for what was announced last year as “4K” or “Quad HD” technology. Basically, the new Ultra HD TV models that are coming to market this year are capable of producing up to 3,840 pixels by 2,160 pixels of resolution. Compare that to the current Blu-Ray 1080P standard of 1,920 x 1,080 pixels and you start getting a pretty good idea of how much more screen resolution you’re getting: basically 4 times the resolution. The difference between a new Ultra HD TV and your current 1080P TV is so striking that when compared side-by-side, the image displayed on the 1080P TV looks almost “blurred” compared to the Ultra HD model. The exciting news is that these new TVs are finally coming to an AVU store near you. Sony, LG and Samsung have already started shipping these Ultra HD TVs and they are expected to arrive in stores sometime in March. Sharp and Toshiba models have also been announced and will be available in late Spring/early Summer. If you are one of the early adopters of this new technology, you may be wondering “How do I get this shiny new TV to play movies at 3,840 X 2,160 (or 4K) resolution?” At this early stage, most people will be playing their existing 1080P Blu-ray movies in “upconvert” mode. It’s not true 4K but judging by what was on display at CES in Vegas it is noticeably better looking and sharper than watching it on a 1080P TV. Some experts also predict that it will be possible to convert 4K content at the highest bitrate available on the current Blu-ray standard and package it on Blu-ray discs. Another alternative is to include pre-loaded movies with each Ultra HD TV. That’s the direction Sony has chosen by including a hard drive pre-loaded with ten Hollywood movies that have been remastered in 4K. Sony has also announced that they will provide a downloadable movie service later this year. LG has already demonstrated in Korea that 4K terrestrial broadcasting was now a reality. So if you are familiar with the way new technology evolves, there is no doubt that 4K content will be available shortly after these new TVs hit the market.